Stress testing is normally done to measure the amount of stress you can manage before developing a shortage of blood flow to the heart muscle. This test is usually carried out by a doctor or a trained technician. There is a variety of stress tests including: Dobutamine or Adenosine stress testing, stress Echocardiogram, nuclear stress tests and treadmill stress tests. Dobutamine or Adenosine stress testing is used for people who are unable to exercise. They are given a drug in which makes their heart respond as if they were exercising. The doctor can then record how their heart responds to stress without exercise being required. Stress Echocardiogram is often called “echo” and is a concrete outline of a heart’s movement. During this test, you can visualize the motion of the heart’s walls and pumping action when the heart is stressed. Nuclear stress tests determine which parts of your heart are healthy and which parts are unhealthy by injecting a small amount of radioactive substance into the patient. Afterwards, the doctors use a special camera to view the rays transmitted from the substance inside of the body. Clear pictures of the heart tissue are then produced on the monitor. Treadmill stress tests are also known as the exercise stress test or stress ECG. This test is used to provide information about how the heart responds to exertion including walking on a treadmill or pedaling a stationary bike at increasing levels of complication. 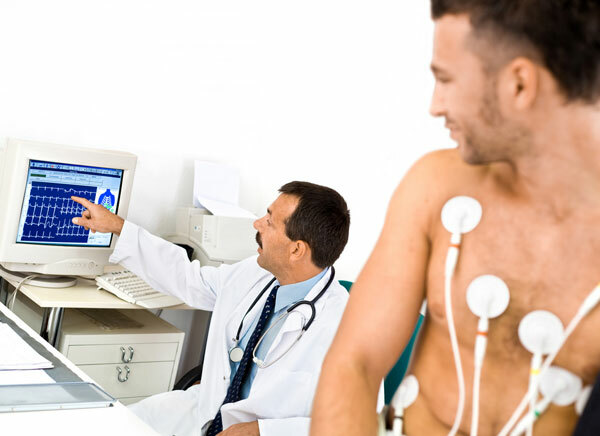 While doing the treadmill stress test your electrocardiogram, heart rate, and blood pressure are being analyzed. The most common stress test that’s operated is the exercise stress test. On the treadmill, the doctor or technician will place 10 flat, sticky patches called electrodes on your chest. The electrodes are connected to an ECG monitor that reflects the electrical activity of your heart throughout the test. The exercise stress testing will continue until you’ve reached your target heart rate, have acquired chest pain, are fatigued, or are having pain that stops you from continuing. Sometimes people experience dizziness, palpitations, shortness of breath or chest discomfort during the test. You may feel a mild burning or stinging sensation once the electrode patches are on your chest and a squeezing sensation might occur when the blood pressure cuff on your arm is inflated. When preparing for any type of stress testing you cannot smoke, eat or drink three hours prior to your test. Tea, coffee, pain relievers with caffeine included and all sodas (even caffeine-free ones) are asked to be avoided 24 hours before your testing. Stress tests are typically safe. A heart attack or dangerous irregular rhythm is very rare.